I recently spent a morning with a grower who was trying to find out how efficient his citrus fertility program was. His fertilizer practices were carefully considered combinations of granular fertilizer and fertigation based on foliar sampling and yield history. We were there to observe some European consultants who were measuring mineral nutrient levels in the root zone and below the root zone. They simulated 1 inch of rainfall to see how much of the fertilizer was left in the soil. Their results? Almost nothing was left in the root zone. In other words, immediately after a good rain, the plants would be deficient in nutrient uptake. As we talked, the consultants, who had never worked with Florida’s fine sand, began to refer to it as an “open hydroponics” system. At that point, the grower suggested that he simplify his relationship with the fertilizer company by sending them a regular check with no need to actually apply any fertilizer. The trees could be getting some residual benefit, but he felt he was throwing his money away. In the era of HLB, in which most citrus trees have compromised root systems, improving fertilizer-uptake efficiency is especially important, and in the typical sandy Florida soil, it is especially challenging. What can be done? One answer is more frequent and smaller doses of fertilizer. Over the past few years, automated injection systems have become more cost effective. Likewise, controlled-release fertilizers have become more common. Both of these are important options that growers should consider. However, there is also an older approach that should be considered in combination with modern techniques. Soil organic matter can improve soil water and nutrient retention, and a little bit can go a long way. The Midwest is one of the most productive agricultural areas in the world, partly because of high organic-matter soils. Given that sandy soil has a very low cation exchange capacity (CEC; a measure of nutrient-holding capacity), and soil organic matter has a very high CEC, increasing organic matter even just a little bit could contribute greatly to plant nutrition. 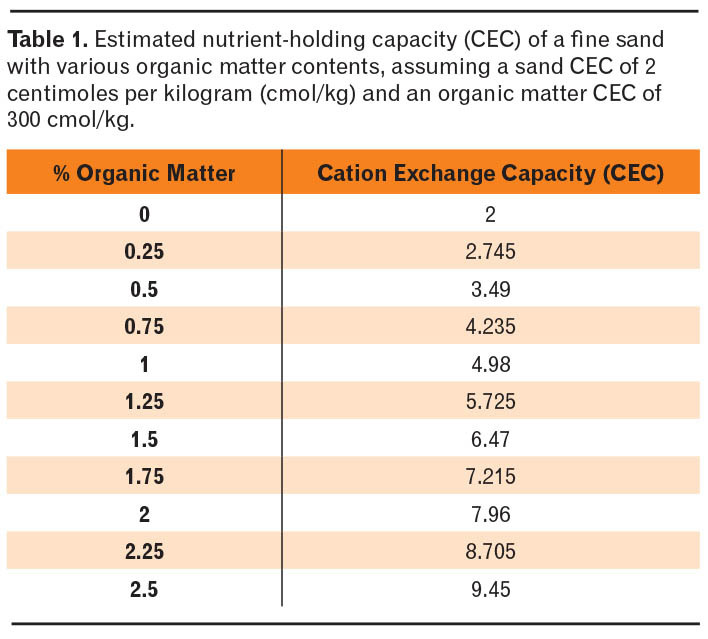 For example, raising organic matter from zero percent to just one-half of 1 percent could nearly double the CEC of a Myakka fine sand (Table 1). Organic matter also improves water relations, increasing soil water retention. When organic matter is applied to the soil surface, it reduces evaporation. Most soil organic matter comes from natural vegetation, also known as weeds. There are obvious reasons why producers would want to remove weeds from the tree root zones, but weed control has had the unintended consequence of not replenishing the soil organic matter. Meg Singh, an emeritus weed scientist at the Citrus Research and Education Center, said that decades of weed-free rows over the years have left growers managing groves with almost no organic matter. This comes at the great cost of lost fertilizers. While current citrus production practices tend to reduce soil organic matter, there are ways we can reverse this trend. Because soil organic matter is always decomposing, and the warm, humid Florida summers speed decomposition up, addition of soil organic matter is not a one-time activity. It is a repetitive process that must be maintained over time, if the soil organic matter is to be maintained or increased. The most straightforward method of increasing soil organic matter is to haul in an external source. The sources vary in cost and quality, ranging from composted animal manures, which bring additional mineral nutrients, to very carbon-dense forestry byproduct mulches. All of these sources are relatively expensive, ranging from $100 to $300 per acre in material and application costs, and food-safety regulations mean that growers must be careful about the source of the material and the timing of application. Still, some researchers have concluded that these kinds of inputs can be profitable because they generally improve yield and soluble solids. Figure 1. 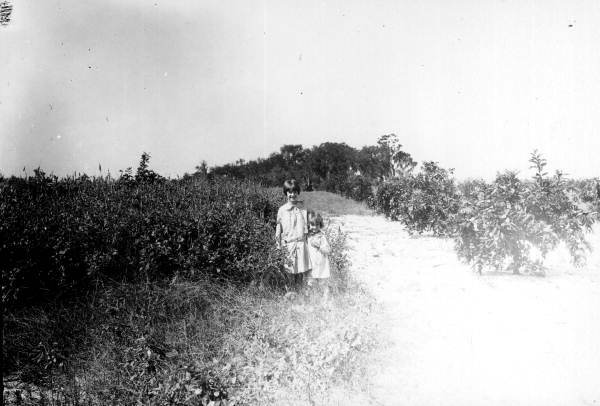 Two girls stand in a field with citrus trees and Crotalaria striata on the left and clear cultivation on the right. When fertilizers became inexpensive in combination with herbicides, cover crops fell out of favor. But cover crops aren’t just indirect fertilizers; they improve soil tilth in many ways and may be a good option for increasing soil organic matter in depleted citrus soils. Essentially, a cover crop should be chosen to successfully compete with weeds, but not with the citrus crop. This is not an easy requirement to fulfill. Perennial peanut (Arachis glabrata) is a good option in groves that can achieve establishment, but there are reports of spotty success with establishment. The benefits of cover crops over applied compost or mulch are that only the seed must be transported, and in the case of perennials, they don’t have to be planted every year. Intercrops, in this case, are cover crops that are not grown on the same soil as the cash crop. Intercrops can be grown in aisles (row middles), and thus may suppress sources of weeds in the weed-free row. More vigorous species can be used as intercrops than cover crops, because in the aisle, the intercrop doesn’t compete as much with the cash crop. This enables the use of species that can produce a great deal of organic matter, such as sunn hemp (Crotalaria juncea) or sorghum-sudangrass (Sorghum bicolor x S. bicolor var. sudanese), though other species may be equally effective. Still, the organic matter doesn’t fall directly over the root zone unless it is moved there. If you wanted to, you could try mowing it, then raking the thatch from the aisle to the bed, like I did in my dissertation research with papaya, but I don’t recommend it! For some time in unirrigated areas of Brazil, growers have been using a method that may be useful to Florida citrus growers. This approach is called “ecological mowing” because it helps conserve organic matter in the citrus tree root zone. It uses a reverse-direction, power-take-off drive on a two-blade, brush-type mower to drive the debris out of the aisle and under the tree canopy. This approach simplifies the process of moving the organic matter from the place where it was produced to the place where it can improve conditions for the citrus plant. There are many physiological reasons to believe that cover crops or intercrops can improve citrus growth conditions. For example, more vegetation in the planting leads to high relative humidity, which helps citrus plants maintain higher photosynthetic rates. Cover crops often lead to reduced canopy air temperatures, which could be a benefit in the summer or a risk in the winter. These have not been tested in the context of cover crops in Florida citrus and will require some research to validate. Citrus production could be improved by increasing soil organic matter in the under-canopy root zone. 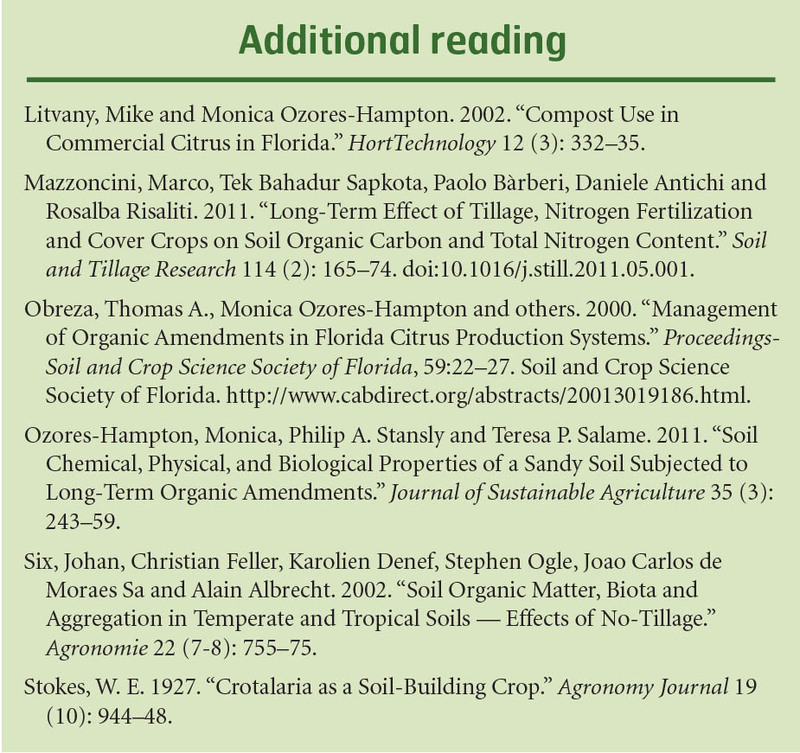 Current production practices tend to reduce soil organic matter in Florida citrus, but known practices of mulching, compost application, cover crops and intercrops could improve soil organic matter content in Florida citrus groves, leading to better fertilizer use efficiency and better citrus production. Christopher Vincent is an assistant professor of tree physiology at the University of Florida/Institute of Food and Agricultural Sciences Citrus Research and Education Center in Lake Alfred.